Space – a sense of isolation, independence and personal investigation into interior and exterior elements – pervades Pieces of Old Sky, trombonist Samuel Blaser’s fourth release as leader. Blaser, returning collaborator Thomas Morgan (bass) and new members Tyshawn Sorey (drums) and Todd Neufeld (guitar), traverse along ambient/free jazz terrain that has a depth of vision and clarity revealing musical maturity beyond Blaser’s nearly three decades of life (he was born in 1981). This 56-minute, 7-track outing has a scope and sound similar to some artists associated with the ECM label as well as modern creative composers like Henry Threadgill and Grachan Moncur III. In other words, Blaser’s work combines reflective ambience with material that looks to the past (Mingus’ and Monk’s influence can be heard at times) as well as the future (there is much innovation and a quest for discovery that is felt throughout) while building art that has a desolate refinement. 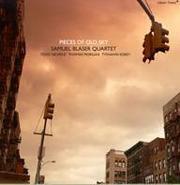 Pieces of Old Sky commences with the 17-minute title track, an epic opus that exemplifies the quartet’s meditative mannerism. Neufeld sketches soundscapes on guitar while Blaser contributes understated hues that give a spectral solicitation to the slowly revolving improvisation. This is a tune that requires patience, since there is no sure resolution. The rhythm section provides soft measured bass and percussion punctuation, at times just a plucked note or a brushed cymbal. About ten minutes in, the song takes on a bluesy configuration, Blaser offering an absorbing trombone solo as Sorey and Morgan render a brisker stride. The piece concludes as it starts with a contemplative poise filled with instinctive pauses. The band’s pensive personality is also mirrored during two twinned interludes, “Choral I” and “Choral II,” both under three minutes. The first condensed cut is a dulcet duet between Blaser and Neufeld. The moderate sounds seem to accentuate the vast silences and muted colors of the slipcase artwork: the empty slate of sky, the drab gray-brown of the urban buildings, the watered mistiness of low-lying clouds and the absence of life. The same lingering melody runs through the second brief bestowal. The album-ender, “Choral II,” though, includes all four players, who underscore the impression of half-invisible ghosts that trail among the gentle, watchful notes. “Red Hook” is an explicit stimulant where the four musicians bump up the tempo and demonstrate they can maneuver through a complex arrangement with virtuosity while maintaining a group cohesiveness. Blaser blazes on his horn, his animated tone giving structure to the free-flowing, eight-minute cut while also assisting in adjusting the tune so it never seems too straightforward. Blaser’s approach to phrasing is outstanding, displaying his complete and decisive control. Sorey helps furnish “Red Hook” a restlessness as he continually shifts moods with deftness and dispatch. The composition eventually modifies into a free-jazz section that features avid improvisation that includes a distorted Neufeld effort and also has Sorey in a near fervor on his toms and cymbals. “Speed Game” is comparable. The song is not the noisy nugget the title implies but it does have a vivid impact. There is dynamic dialogue between Blaser, Sorey and Neufeld. Blaser confirms his command of multiphonics and his ability to utilize prolonged, low tones akin to a tuba or bass trombone. As the foursome works their way via the knotty arrangement they exhibit an incendiary discipline and an understanding that attains an almost extrasensory level of communication. “Mystical Circle” is another elongated enterprise tinged with a sensation of secluded pathos. Each player responds to the somber disposition with sympathy. Neufeld presents a bell-like style, his strings echoing in the background as Blaser inserts clusters of trombone chords into the arrangement. Sorey’s bass courses with determination while Sorey illustrates the importance of allowing music to breathe at a slow tempo and that a percussionist can be charismatic without resorting to busy beats. “Mandala” is a further memorable venture. The 11-minute piece has a shaded characteristic. The distilled and sparse arrangement finds the quartet performing a contoured blues motif. Blaser expresses an ebbing inclination that inches forward until he and the others generate a faster setting. The wiry form never disappears but Blaser and Neufeld do add fragments of rumble and torque. Here, Neufeld uses chordal choices and intonations divorced of any transparent influences, although Ralph Towner’s impressionistic focus comes to mind. Morgan’s bass carries a similar poise and providence. Joe Marciano does a superb supporting role as audio engineer/mixer. From the all but inaudible opening to the last ending note, Marciano and producer Blaser sustain a polished depth. Each impeccably tapped percussive element, every nuance of phrasing stands out purposeful and complete. Marciano ably captures the album’s shrouded ambience, where shading and texture are important. This attention to detail is a hallmark of other Clean Feed projects and bodes well for the label and the jazz experts connected with the company.